Labyrinth walking is an ancient practice used by many different faiths for spiritual centering, contemplation and prayer. Entering the serpentine path of a labyrinth, the walker walks slowly while quieting their mind and focusing on a spiritual question or prayer. Join Sister Andrea Westkamp in an exploration of the history of the labyrinth and its use as a method of meditation and prayer. 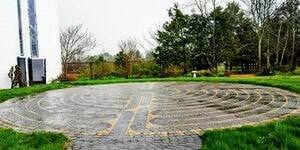 Participants will have the opportunity to walk the Chartres-style labyrinth on the monastery grounds.